This Library of America volume is the third of three devoted to Vladimir Nabokov, and contains the evanescent works of his later years. Transparent Things (1972) is a haunting novella of the anguished life of Hugh Person, a young American editor and proofreader: his marriage, the murder of his wife, and the lone journey to uncover the truth about the past. With its multiple narrative voices and fusion of dream and memory, it is among the most formally experimental of Nabokov’s works. Look at the Harlequins! (1974), Nabokov’s final novel, concerns Vadim Vadimovitch N., a novelist very much like Nabokov himself. This ironic, intricate hall of mirrors, startling in its shifts of tone and off-key echoes of Nabokov’s earlier books, often blurs the line between the worlds of reality and of literary invention. Nabokov’s penciled corrections in his own copies of his works are incorporated into these, the most authoritative versions available, and have been prepared with the assistance of Dmitri Nabokov, the novelist’s son. LIBRARY OF AMERICA is an independent nonprofit cultural organization founded in 1979 to preserve our nation’s literary heritage by publishing, and keeping permanently in print, America’s best and most significant writing. The Library of America series includes more than 300 volumes to date, authoritative editions that average 1,000 pages in length, feature cloth covers, sewn bindings, and ribbon markers, and are printed on premium acid-free paper that will last for centuries. 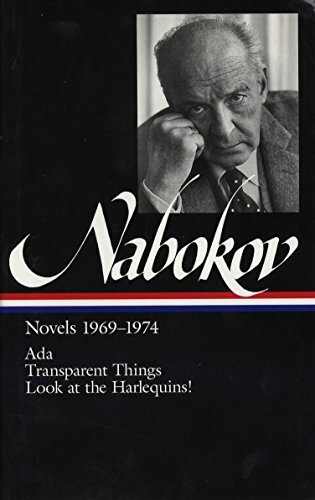 Ada, or Ardor: A Family Chronicle (1969), the longest of Nabokov's novels, is a witty and parodic account of a man's lifelong love for his sister. All of his favorite themes and most characteristic techniques are woven into this culminating work of Nabokov's imagination. Transparent Things (1972) is a haunting novella of the anguished life of Hugh Person, a young American editor and proofreader: his marriage, the murder of his wife, and his lone journey to uncover the truth about the past. With its multiple narrative voices and fusion of dream and memory, it is among the most formally experimental of Nabokov's works. Look at the Harlequins! (1974), Nabokov's final novel, concerns Vadim Vadimovitch N., a novelist very much like Nabokov himself. This ironic, intricate hall of mirrors, startling in its shifts of tone and off-key echoes of Nabokov's earlier books, often blurs the line between the worlds of reality and of literary invention. The texts of this volume incorporate Nabokov's penciled corrections in his own copies of his works and correct long-standing errors. They are the most authoritative versions available and have been prepared with the assistance of Dmitri Nabokov, the novelist's son, and Brian Boyd, Nabokov's distinguished biographer, who has also contributed notes and detailed chronology of the author's life based on new research.